Will the PDO Turn Positive in the Next Few Years? One of the results of this paper concerned the long-term changes in the Pacific Decadal Oscillation (PDO). It predicted that the PDO should return to its positive phase sometime around 2015 - 2017. A. The difference between the actual LOD and the nominal LOD value of 86400 seconds. Figure 4: This figure shows the variation of the Earth's length-of-day (LOD) from 1656 to 2005 (Sidorenkov 2005)[blue curve]. The values shown in the graph are the difference between the actual LOD and the nominal LOD value of 86400 seconds, measured in units of 10^(-5) seconds. Superimposed on this graph are 1st and 3rd order polynomial fits to the change in the Earth's LOD. Figure 7a: Shows the absolute deviation of the Earth's LOD from a 1st and 3rd order polynomial fit to the long-term changes in the LOD (measured in units of 10^(-5) seconds). 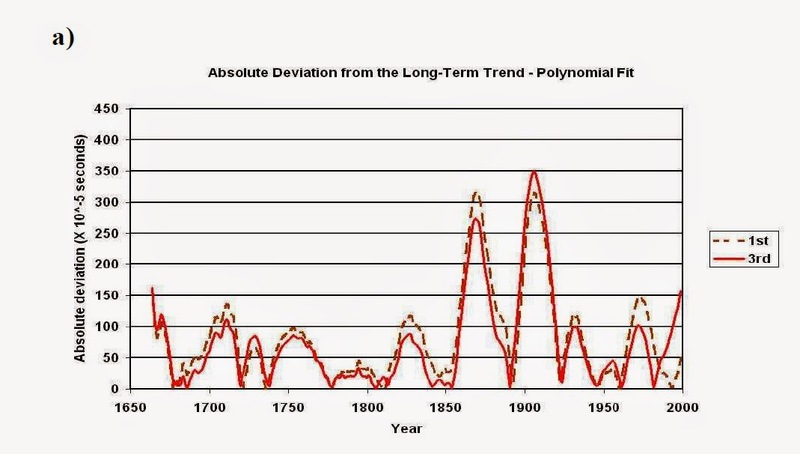 There are nine significant peaks in the absolute deviation which are centered on the years 1729, 1757, 1792, 1827, 1869, 1906, 1932, 1956 and 1972. C. A comparison between the peak (absolute) deviations of the LOD from its long-term trend and the years where the phase of the PDO [proxy] reconstruction is most positive. 1972. The reconstruction has been smoothed with a 15-year running mean filter to eliminate short-term fluctuations. Superimposed on this PDO reconstruction is the instrumental mean annual PDO index (Mantua 2007) which extends the PDO series up to the year 2000. 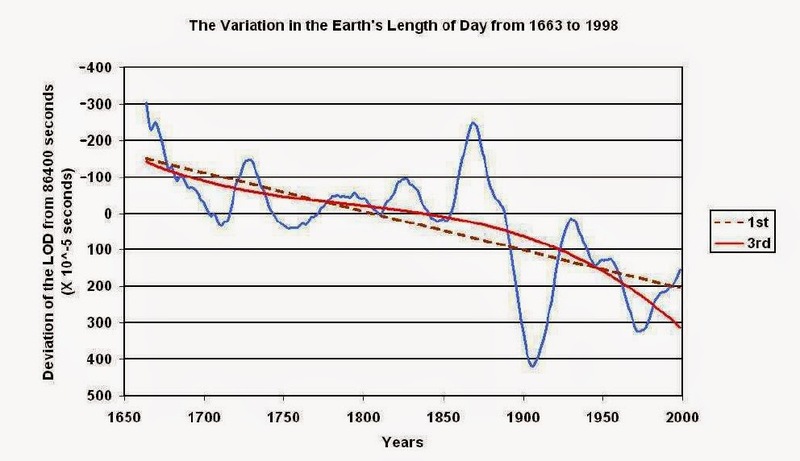 The lower graph shows the absolute deviation of the Earth’s LOD from 1656 to 2005. The data in this figure has also been smoothed with a 15-year running mean filter. long-term trend and the years where the phase of the PDO [proxy] reconstruction is most positive. While the correlation is not perfect, it is convincing enough to conclude the PDO index is another good example of a climate system that is directly associated with changes in the Earth's rotation rate. If you look closely at the peaks in the deviation of Earth's LOD from its long term trend and the peaks in the PDO index shown in figure 8, you will notice that the peaks in deviation of LOD take place 8 - 10 years earlier (on average) than the peaks in the PDO index, suggesting a causal link. 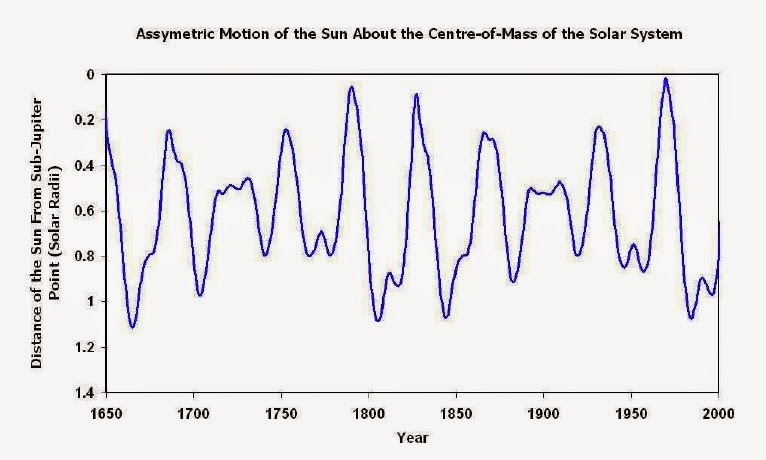 shows that the maximum asymmetry in the Sun’s motion occurred roughly around 1790-91. The path of the CM of the Solar System about the Sun that is shown in figure 9 [above] mirrors the typical motion of the Sun about the CM of the Solar System. This motion is caused by the combined gravitational influences of Saturn, Neptune, and to a lesser extent Uranus, tugging on the Sun. The motion of the CM shown in figure 9 repeats itself roughly once every 40 years. The timing and level of asymmetry of Sun’s motion is set, respectively, by when and how close the path approaches the point (0.95, 0.0), just to the left of the Sub-Jupiter point. Hence, we can quantify the magnitude and timing of the Sun’s asymmetric motion by measuring the distance of the CM from the point (0.95, 0.0). E. The years where the Suns' motion about the CM of the Solar System is most asymmetric. Figure 10: shows The distance of the centre-of-mass (CM) of the Solar System (in solar radii) from the point (0.95, 0.00) between 1650 and 2000 A.D. The distance scale is inverted so that top of the peaks correspond to the times when the Sun’s motion about the CM is most asymmetric. An inspection of figure 10 shows that there are times between 1700 and 2000 A.D. where the CM of the Solar System approaches the point (0.095, 0.00) i.e. at the peaks of the blue curve in figure 10 where the Sun's motion about the CM is most asymmetric. These are centred on the years, 1724, 1753, 1791, 1827, 1869, 1901, 1932, and 1970. Remarkably, these are very close to the years in which the Earth’s LOD experienced its maximum deviation from its long-term trend i.e. the years 1729, 1757, 1792, 1827, 1869, 1906, 1932, 1956 and 1972. This raised the possibility that the times of maximum deviation of the Earth's LOD might be related to the times of maximum asymmetry in the Sun’s motion about the CM. In addition, if both of these indices precede transitions of the PDO into its positive phase by 8 - 10 years, then it could be possible to use the times of maximum asymmetry in the Sun’s motion about the CM to predict when the PDO will make its next transition into its positive phase. F. When will the transition to the next positive phase of the PDO take place? This figure shows the proxy PDO reconstruction of D’Arrigo et al. (2001) between 1707 and 1972 [blue curve]. The reconstruction has been smoothed with a 15-year running mean filter to eliminate short-term fluctuations. Superimposed on this PDO reconstruction is the instrumental mean annual PDO index (Mantua 2007) which extends the PDO series up to the year 2000 [green curve]. 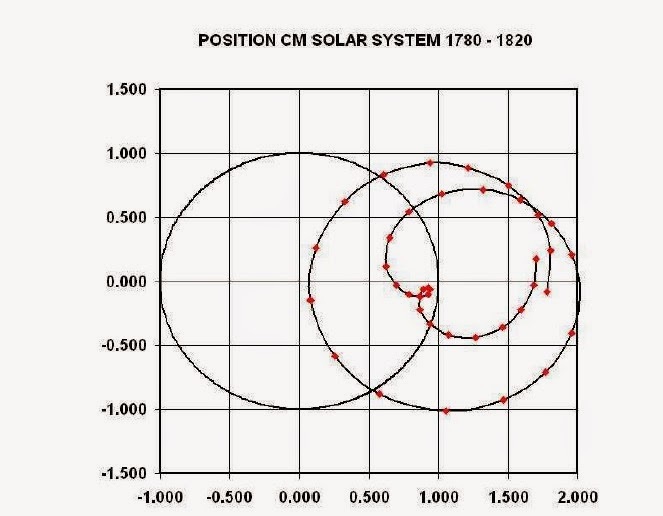 Also shown is the proximity of the CM of the Solar System to sub-Jupiter point which measures the asymmetry of the Sun's motion about the CM [orange curve]. 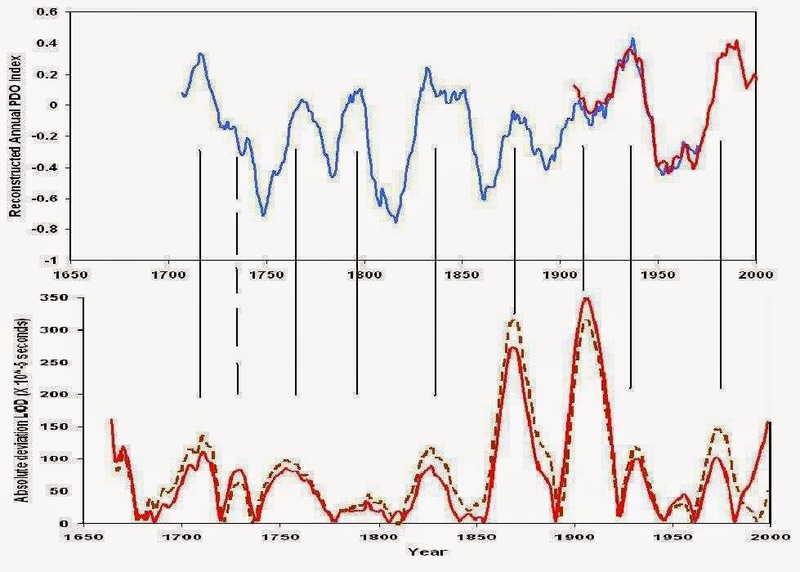 Hence, like the long term deviation of the Earth's LOD from its long term trend, the peaks in asymmetry of the Sun's motion about the CM of the Solar System take place roughly 8 - 10 years prior to positive peaks in the PDO index. 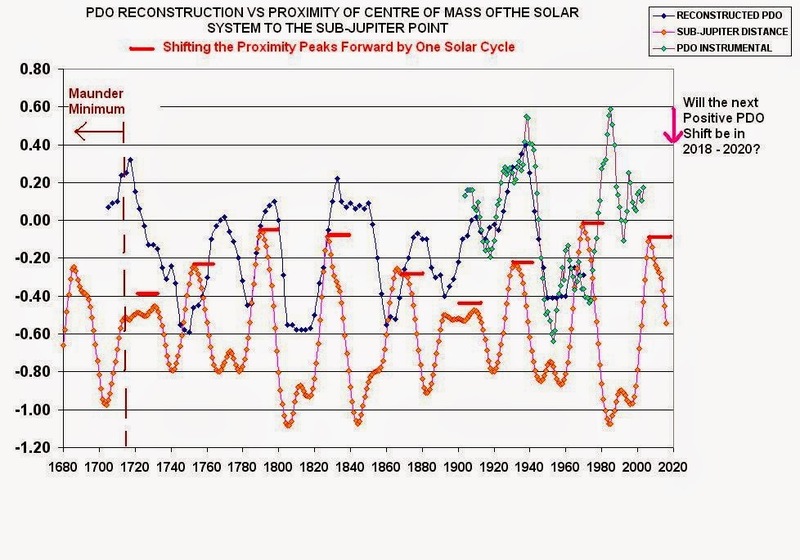 Careful inspection of the figure above shows that Sun's motion about the CM peaks in about 2007 which would indicate that the next transition to a positive PDO phase should take place some time around the years 2015 to 2017. [Note: The above graph shows a prediction made on the assumption that forward shift between the two curves is of the order of the average length of the Hale sunspot cycle = 11 years. It probably a good indicator of the level of uncertainty of the prediction being made]. The following is a list of my recent scientific publications and presentations. I am placing the list on my blog so that others can have easy access. Global Changes. – M.: Scientific World, 2012. – 78 p. [In Russian]. Driven and Do They Affect Climate? The General Science Journal, Dec 2011, 3811. Rate Externally Driven and Do They Affect Climate? Forces Acting Upon the Sun Influence the Sunspot Cycle? The General Science Journal, Dec 2011, 3812.
asymmetries in the solar motion about the barycentre. 2008, 25, 85 – 93.
in the Earth’s rotation and in the climate characteristics. Lohrmann-Observatorium and Observatoire de Paris. Which Came First? - The Chicken or the Egg?